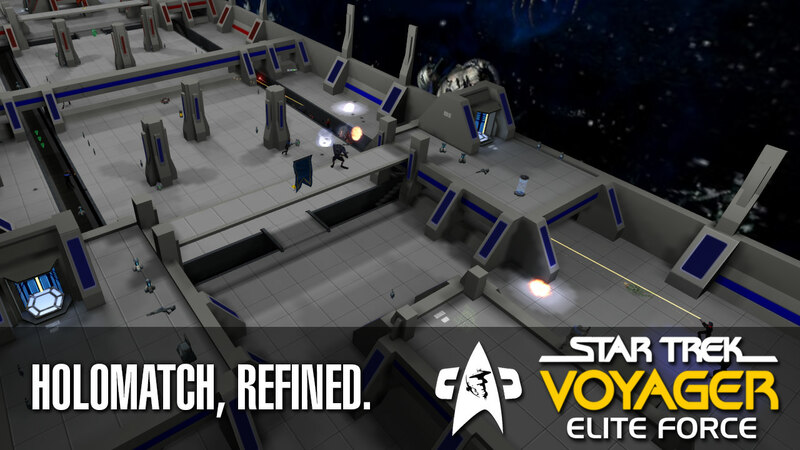 Last month, when The Last Outpost launched our Star Trek: Voyager Elite Force client as "Holomatch, refined," that wasn't just a fancy, branded image. "Holomatch, refined" is a standard, a commitment from us to deliver the best package possible for end users. We want this download to be worth your time and bandwidth, especially in this day and age where data caps are becoming more and more common. To that end, we continue to curate and add content, and make changes to improve the overall game experience. Do you have suggestions for content or tweaks that would improve your experience? We welcome it! Just register here on our forums and head over to the Feature Requests board with your feedback. Reports of bugs, map exploits, and unintended game behavior should be directed to our Engineering board. If you are a creator of one or more modifications included in this client and would like to request that we remove and/or stop distributing your work, please post in the Engineering board. We do our best to properly attribute maps and models to their respective creators in our Mod Licenses folder, but no one's perfect!